Can’t decide between fondue, Chinese food, or a scalding winter soup? 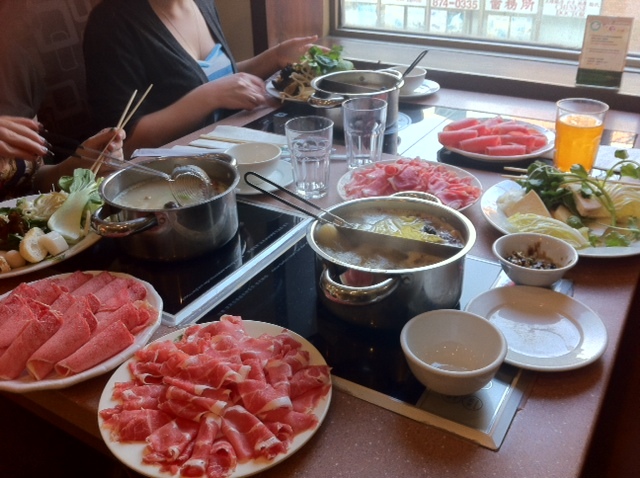 It’s time to stop by Chinatown for the all-you-can-eatery Little Sheep Mongolian Hot Pot. Here’s the down low: gather two to four friends, order a personal pot of broth, say ‘yes’ when they ask if you want platters of raw lamb and beef, and then load up your plates at the buffet. When you get back to the table, bring your soup to a boil with the magnetized hot plate built into the tabletop and start cooking everything you can get your chopsticks on! It’s an outing of guaranteed amusement. For anyone less talented in the kitchen, there’s no need to fret. Sure it’s all about timing to get the perfectly tender slice of meat, but no matter how long something soaks in this marvelous broth, it is bound to taste delicious. The soup bases come in original herbal broth, spicy, half-and-half (with a divider down the middle of the pot to enjoy both original and spicy), and vegetarian mushroom to add a veggie-friendly option. Unless you have a numb tongue or a high tolerance for spicy food, it is highly recommended to get either original or half-and-half. The spicy broth alone has enough ladle-fulls of chili peppers to render your esophagus molten before a single bite reaches your stomach. There’s a vast array of tastes to be tried at the buffet, such as fresh greens (spinach, bok choy, watercress), mushrooms, root vegetables, tofu, dumplings and noodles. Dinner also includes seafood options like shrimp, fish and calamari. Two complaints would be that the plastic curtains hanging in front of the food to keep it “fresh” are a little on the sketchy side, and the labels on the containers rarely match what’s inside leaving a lot of mouthfuls up to guesswork. That aside, the desserts are surprisingly good, so save some room if possible for their mini whipped-cream pies, macaroons and tubs of mysterious ice cream flavours. In all, the place has a cute semi-formal, semi-kitsch look to it, with tall booths for privacy, and tables for two with a single hot plate in the middle to share. K-Pop’s lively background beat, along with the matching music videos on plasma screens provide entertainment when mouths are too full for conversation. The ever-polite staff may not be the most talkative, but they are considerate and extremely quick, and will even top-off your broth if they notice your soup level is getting low. Considering it’s an all-you-can-eat, the price is very reasonable. Lunch is $15, and though dinner is noticeably more expensive at $25, it is because of the seafood that is offered only in the evening. Soft drinks and juices are included in the price. Little Sheep closes after lunch at 3 p.m. and then reopens later for dinner. For anyone who doesn’t have cash on them, that’s fine as debit and credit are accepted. While Little Sheep’s hot pot does deviate from its authentic Mongolian origins, this evolved Chinatown specialty is arguably the best of its kind in Montreal. Perfect for a casual date or a no-occasion outing with friends. Little Sheep Mongolian Hot Pot is located on 50 de la Gauchetière St. W.